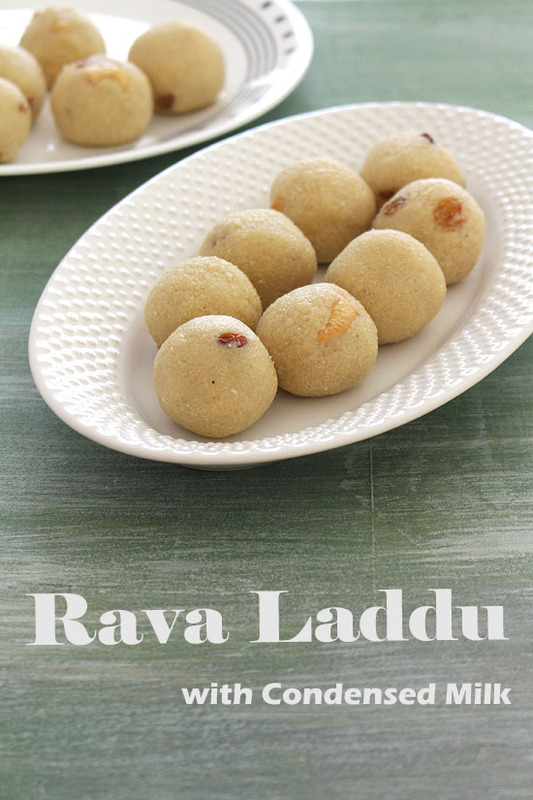 Rava laddu recipe – EASY ladoo recipe made with semolina and sweetened condensed milk. This rava laddu was in my to do list since last year. Last year I have tried with sugar syrup and I end up with rock hard ladoo. I must have been messed up with syrup, I guess. So this time I came across to Rathai’s recipe that calls for condensed milk and I immediately noted down and tried. The end result was too good, beyond my expectation. Here I have added little dry coconut too, but that is optional. Many times I do make rava laddu with fresh coconut as well. The texture of the laddu is soft and almost melt in your mouth kind. Do give it a try. 1) Heat the ghee in a pan on medium-low heat. 2) Once hot add cashews and fry with stirring constantly till they get light brown in color. Remove it to a plate. 3) In the same ghee, add raisin and fry till they get plump. 4) Remove it to the same plate and keep it aside. 5) In the remaining ghee, add semolina. 6) Roast sooji with stirring continuously on LOW-MEDIUM heat for around 8-10 minutes. In beginning, you will find that rava is heavy and you will have to make some effort to stir it. 7) Continue roasting till you get nice aroma of sooji and it will get slight color change. NO need to brown them. Once roasted, you will find that rava is very light while stirring. 8) Now add desiccated coconut. 9) Mix and roast for 1-2 minutes, you will get nice toasted aroma of coconut. 10) Remove this mixture to a plate. Let it cool for 4-5 minutes. 11) Now add cardamom powder. 14) Also add fried cashews and raisins. 15) Start mixing till it comes together like a dough. If it looks dry you may add little water at a time and mix. You may not need to add any water, it depends on the quality of sooji. Some types of sooji absorbs more liquid while some less. I have not added any water. 16) Let this mixture become warm and cool to touch. Then grease your palm with ghee and start shaping them into ladoos. Let the laddo set for some time and let it cool completely, then serve. This tastes best the day it is made. After couple of days it may starts to harden up more. Serving suggestion: Enjoy rava laddu any time of the day or serve as a sweet along with your meal. It is usually made during festivals like diwali, bhai dooj. During the Ganesh Chaturthi festival, it is offered to Lord Ganesha as a prasad and then served to devotees. 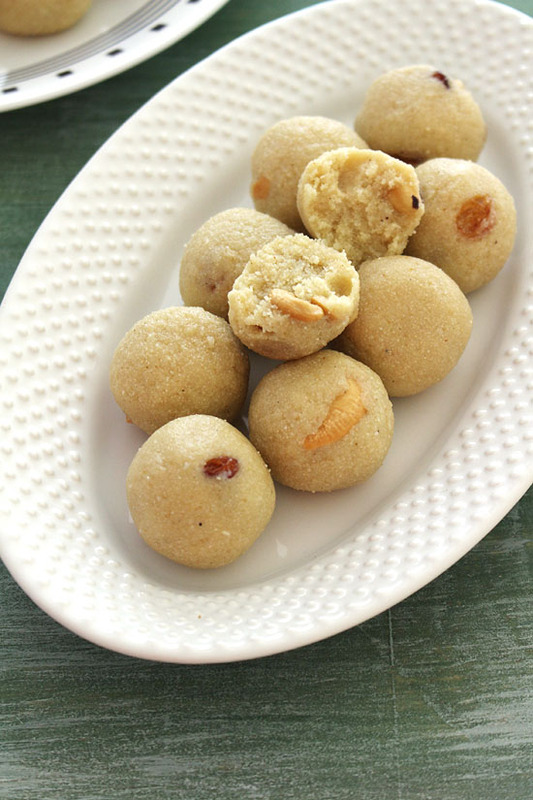 These rava laddu are made with semolina and condensed milk. 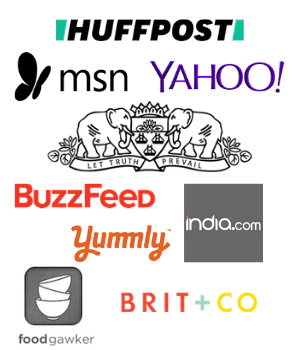 These are usually made on festivals like ganesh chaturthi. Heat the ghee in a pan on medium-low heat. Once hot add cashews and fry with stirring constantly till they get light brown in color. Remove it to a plate. In the same ghee, add raisin and fry till they get plump. Remove it to the same plate and keep it aside. In the remaining ghee, add semolina. Roast it with stirring continuously on LOW-MEDIUM heat for around 8-10 minutes. In beginning, you will find that rava is heavy and you will have to make some effort to stir it. Continue roasting till you get nice aroma of sooji and it will get slight color change. Once roasted, you will find that rava is very light while stirring. Now add desiccated coconut. Mix and roast for 1-2 minutes, you will get nice toasted aroma of coconut. Remove this mixture to a plate. Let it cool for 4-5 minutes. Now add cardamom powder. Mix well. Add condensed milk. Also add fried cashews and raisins. Start mixing till it comes together like a dough. If it looks dry you may add little water at a time and mix. Let this mixture become warm and cool to touch. Then grease your palm with ghee and start shaping them into ladoos. Let them set for some time and let it cool completely, then serve. They tasted yummy…..but unable to bind them.I also added some water but round ball were not perfect like yours. if the mixture is dry then you can add more condensed milk or regular milk to bind. While shaping, grease your hands with ghee, so the mixture does not stick the hand and you will be able to make round shape. Too much ghee is it supposed to be tbsp instead of cups?